The oil of black seed (Nigella sativa) also known as black cumin has been used by traditional healers for centuries. In the Middle East and across the Islamic world it is regarded as one of the greatest healing medicines of all, with a wide variety of applications. The old Latin name for black seed was “panacea” meaning cure all. Modern herbalists use it most commonly in assisting with the treatment of asthma, cancer and type 2 diabetes. Various research studies have found Black seed oil and its chief constituent thymoquinone (TQ) to demonstrate potential for use in treatment for cancers such as pancreatic, osteosarcoma, bladder, breast, colon, skin and lung. While we found plenty of in-vitro and animal studies there does appear to be a lack of research into this aspect of black seed using real humans. A 1999 study in the European Journal of Cancer Prevention using mice found that black seed oil was a powerful chemopreventive agent with the potential to be used as a treatment for stomach cancer. A 2010 Random Control Trial study by Bamosa et al involving 94 patients found Nigella sativa at a dose of 2 gm/day caused significant reductions in fasting blood glucose. The researchers concluded “Nigella sativa might be a beneficial adjunct to oral hypoglycemic agents in type 2 diabetic patients“. 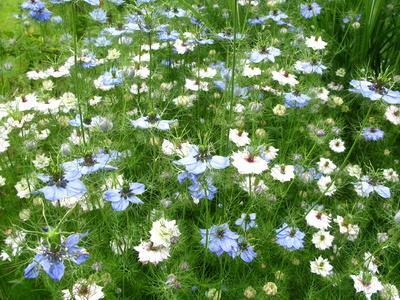 A 2010 study by Boskabady et al of asthmatic patients using boiled extract of black seed showed that nigella sativa has a relatively potent antiasthmatic effect on asthmatic airways. However, the effects of boiled extract of this plant on most measured pulmonary function tests was less than those of conventional treatments salbutamol and theophylline at the concentrations used. A 2017 study by Koshak et al involved a randomised, double blind, placebo controlled trial studied 80 subjects with asthma. Half were given 500mg (less than half a teaspoon) of Nigella sativa oil twice a day for four weeks and compared with 40 subjects given a placebo. The results showed a significant improvement in pulmonary function and asthma control test scores. Improvements were also seen in blood markers linked to asthma inflammation. The researchers described the effect of Black seed oil in normalising blood eosinophilia (a type of white blood cell) as ‘remarkable’. Elevated levels of white blood cells in your blood can be an indicator that you have an inflammatory illness or infection. This trial demonstrates that Nigella sativa oil supplementation can help improve asthma control as well pulmonary function in a relatively short period of time. This is particularly helpful for asthma patients who often struggle with the side-effects of their conventional treatments and abandon regular intake of medicine. Information provided in our blog is not meant to replace the advice of your health professional. We always recommend you consult a registered herbalist or a GP sympathetic to alternative healthcare.